I have been a fan of sniping in games ever since the good old days of the original Halo. Taking that one skilled shot and downing an enemy from across a map is an absolute thrill and something that frankly, never gets old to me. Sniping in VR has been a bit more of a mixed bag, often been a tacked-on mode to another game (see Out of Ammo or Killing Floor) and has, more often then not, been a little disappointing when it comes to it’s implementation. The Perfect Sniper aims to be the remedy to my woes by putting you behind the scoped rifle and taking out bad guys in your efforts to clean the streets from the crime plaguing them. Line em’ up and take em’ down! While all 3 controllers are supported, I had issues with the DS4 and only used the Moves and Aim Controller with a patch coming shortly for the DS4, according to the devs. 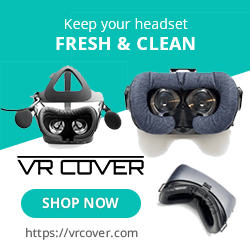 With the Aim controller, it’s simple, bring it up to your face, line up your shot and fire. reloading is handled by the press of a button and that’s really about that. Moves are little more cumbersome as you need to manually reload by letting go of the gun with your off hand and pulling back the cartridge chamber, releasing the shell and putting in the next round. You can’t fire until both your hands are back on the gun and overall, I found the moves to be more hassle than they are worth, but for those looking to put a little more sim into their sniping, they do that. Either way, each stage has you at some vantage point whereupon you must take out a designated target, typically in 1 shot. There is no movement to speak of, not even a turn option, just point and shoot and that’s it…and I like it that way. The Perfect Sniper could benefit from Pro support, which I’m sure it doesn’t have, as the visuals are washed out and blurry. Regardless, the world this takes place is on the cartoonish side with characters that look a little blocky. The stages are mostly overlooking city streets or a few other city areas (parks, parking lot…) and look a little on the drab side but are populated with a fair bit of sprites making the world feel a little more authentic. 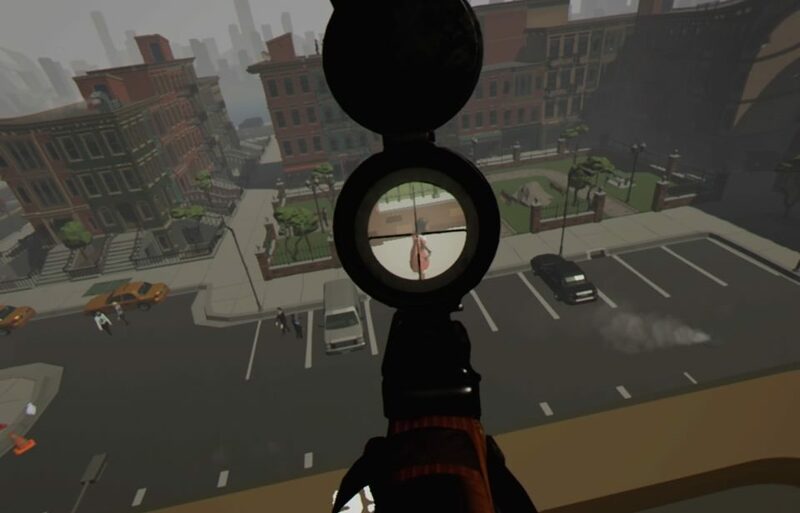 The scope in The Perfect Sniper does a great job of zooming in on the action and while it may not be the most visually impressive game in VR, I never encountered any issues lining up my sights and taking down the bad guys. Snow and rain pop up in a few stages and other effects like smoke or the way people on the street animate add a lot of charm and life to the game . Sometimes selecting your target isn’t so easy. 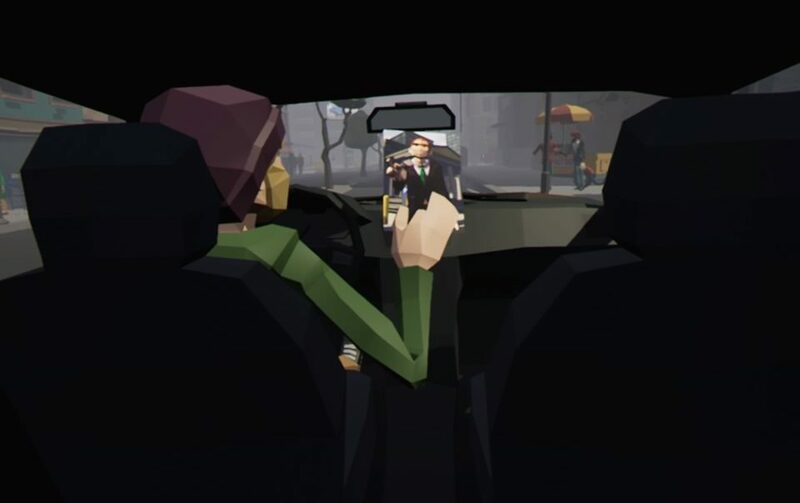 Your driver narrates the game and tells you who to shoot, why you are shooting them and basically just stitches together each scenario. Some dramatic and actiony music peppers the campaign giving the entirety of the game a very cinematic feel. Your gun shots sound great and even the ambient sounds from the rain and other effects from the street give additional life to this world. As there is only sniping here the missions may start to feel the same to some, but I liked every new scenario I was thrown into. Each sniping stage starts off with you already in your vantage point and your driver gives you a clue about who your target is (‘He’ll be angry’, or ‘she’s on lunch’…) so it’s not just about looking at a picture and finding that sprite but taking in that clue and figuring out who the target is. Shooting the wrong person results in instant failure and a level reset whereupon you can try and try again until you shoot the right guy or gal. 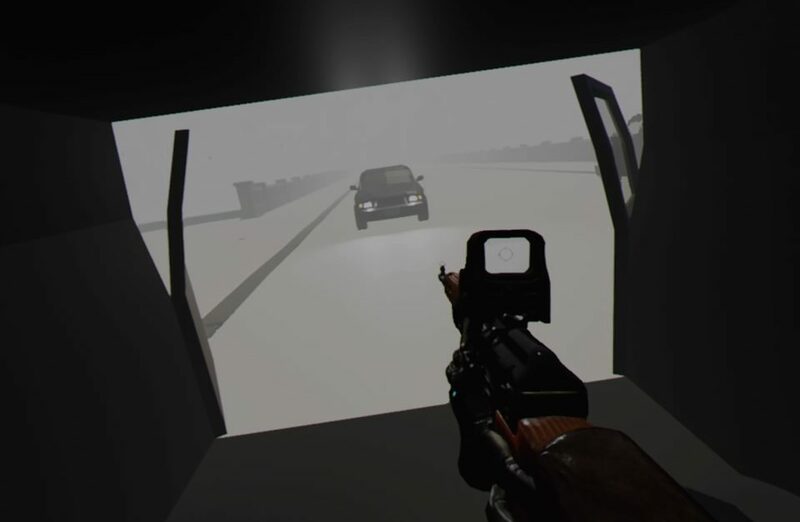 Breaking up the stationary sniping are a few driving missions where you are in the back of a van and must take out the mob cars chasing you. These sequences are fun, but the driving is comically slow, hampering the action. This is your handler and that is your target. 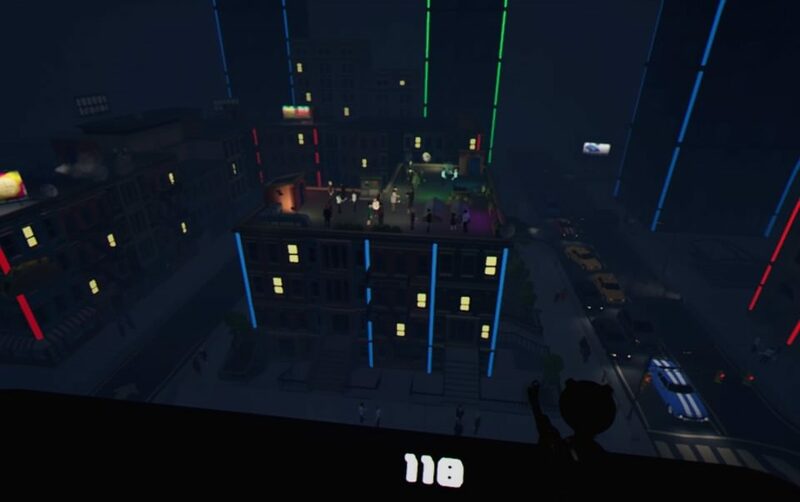 Besides the 1-hour(ish) campaign is 2 other Arcade Modes; Target practice and Speed Challenge, both of which involve shooting targets that appear in the air in front of you, shooting as accurately as possible or as quick as possible without missing a shot. These are alright, but pale in comparison to the action in the campaign as trying to find that person to shoot is just way more satisfying than taking out floating bullseyes. A random mode where you are given a target and just have to find them in the streets feels missed as I could probably play that for hours. I didn’t have to many issues with The Perfect Sniper. I experienced some drift with the Aim controller, but I wouldn’t hold that against the game. I also found myself bringing the rifle to close to my face, cutting off the view through the scope with either control method so be aware of that issue, but it’s easy to make that mental adjustment. The story presented isn’t really anything more then fluff, but like I said, works as far as setting up your next target and when it ended, I wished for more missions. There is almost no reason to revisit the campaign after you have beaten it as nothing changes up so you know where and who the targets are after the initial play. There is also a fair bit of asset and environment recycling going on and a few stages are the same, just from a slightly different vantage point, belying its indie roots. The Perfect Sniper is a simple game with a simple premise that to me, delivers what it needed to make this a fun, albeit, short experience. Finding your targets based on a singular clue, and the specific mission variables mixed up the stages enough to make me enjoy shooting a path through the criminal underworld. If your looking to just snipe stuff in VR, you’ll probably have as much fun as I did with The Perfect Sniper. What would I pay? $15 is an ok price for this, but the limited replayabilty kind of makes me feel like this should be in the $10 range. With that said, I really did enjoy the campaign and the sniping is solid!